The first thing I need to do is confess. I had no idea what CTS stood for until I started to write this, I doubt many people did, it was always just “CTS”. The name moved to Wembley from downtown London in the early 1970’s when real estate development forced the original CTS to close and seek a new home. This made a merger with the newly built but technically still unpolished Music Centre seem, to all involved, like the perfect match. However, as these things usually go, the personality of one partner is ascendant and by the early 1980’s it was again simply CTS. Living so close to a major sporting venue (Wembley Stadium) was always factor for CTS and in the end, brought about its demise. I interrupted one of my recording projects for a weekend because Manchester United and Newcastle were meeting at the stadium and that meant the studio was closed down. Period. When the stadium decided to undertake a major renovation in 2000 the studio was sold. There was a brief attempt to reopen it in ‘02 but the building was finally demolished in 2004. Considering it was likely the first room in the entire UK to be designed as a recording space (previous studios were all conversions), the big room at CTS was an odd shape for a purpose-built studio. A long rectangle with a high ceiling, it seemed to have endless reverb. 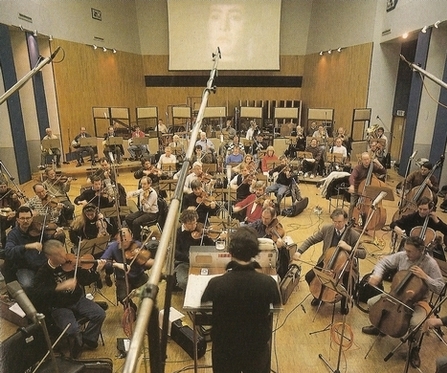 The standard layout was to place the orchestra facing one of the short walls, making it narrow and deep and to minimize the effect of that reverb the mics were generally placed very close to the players. We had heard of Dennis Sands bucking these conventions on the original Judge Dredd score and after speaking with him (and listening to that recording), we decided that we liked his approach. He placed the conductor halfway along one of the long walls making the orchestra shallow and wide. It remained a tough space to manage and keeping watch on the performance dynamics was crucial to getting any type of separation on the tracks. However, the room did have a bit of magic and when everything was working it could sound really warm. Making multi-track recordings of an orchestra is kind of like steering an oil tanker with a tug boat… it can be done but you need to plan ahead and you don’t want to have to force things as you are seriously out-weighed and can’t allow the laws of physics to end up working against you. Otherwise you’ll just be crushed on the rocks. CTS was like doing this in high seas. On my first trip to work in London at CTS, we decided to leave the first day open to recover from the overnight flight. I love how the flight attendants try to make you feel like you’ve slept for a full eight hours on the flight from the eastern US to London. They finish the meal service and turn off the lights for about 90 minutes and then charge through the cabin waking you as if you’re a teenager who has overslept and missed the school bus. They’re all smiles and energy but your body is telling you it’s 2 am. Then you land and find that the hotels won’t allow you to check in for another four hours, so you end up feeling like some type of time-travel refugee with nowhere to lay down and sleep. This is how my coworkers and I found ourselves staggering around London looking for something to occupy the burnt cinders of our sleep-deprived brains. After reenacting the pedestrian version of the “Look kids, Big Ben” scene from “European Vacation” and more than once requiring the “LOOK RIGHT” painted on the asphalt to save us from being killed crossing the street, we ended up at Westminster Abbey. Walking through the door, one of my compatriots was asked to remove his hat; this was done with just enough derision to make us feel like foolish Yanks for not realizing that this was a house of worship and only an oafish brute would be so discourteous as to continue to wear a hat. The truth is that we probably wouldn’t have been able to name the country we were in at that point; we were sleepless zombies from the future not insensitive tourists. But five steps later, we realized the gravity of where we were standing: The Tomb of The Unknown Warrior for the United Kingdom. When I say standing, I mean literally. The tomb is in the floor, only a few yards into the massive building. Then we began to realize that nearly the entire floor is famous tombs and graves. It was a combination of being totally humbled and completely awkward – no hats, but it’s okay to just walk all over these graves?!? At that very moment, an announcer came on over the public address system and told us that as was customary in The Abbey, several times a day they would offer a topic for contemplation, prayer or to simply to guide your thoughts as you walked through the building. The voice asked us to consider the gift of music and what it meant to our lives, how it touched us, what it gave us and what opportunities it offered us. Holy crap! How did the voice know? I was blown away; it was a miracle. We had been blessed… Then I looked over and saw that my one friend was still pissed off about the whole hat thing and the other was barely fighting off the urge to simply lie down on the floor. We did manage to complete an abridged tour of The Abbey and it was agreed all-around that the voice’s offering was a good sign for the sessions we were to begin on the following day. Google CTS Studios and you’ll see there’s a bunch of great sites with all kinds of history about the place. There are also some really good general sites with information about all the famous British Studios.